Greg Robertson is Chairman and Managing Director of TM Capital Corp. Greg led the formation of TM Capital Corp. in 1989. Prior to founding TM Capital, he was an Executive Vice President and Director of Thomson McKinnon Securities Inc., where he headed the firm’s investment banking and public finance activities. Previously, Greg served as a Vice President in the investment banking division of Goldman, Sachs & Co.
Greg received a BS in Chemistry from the Virginia Military Institute and earned an MBA from the Darden Graduate Business School at the University of Virginia. Prior to returning to graduate school, Greg served as an officer in the Air Defense Artillery branch of the U.S. Army and worked as a research chemist for E.I. du Pont de Nemours and Company. 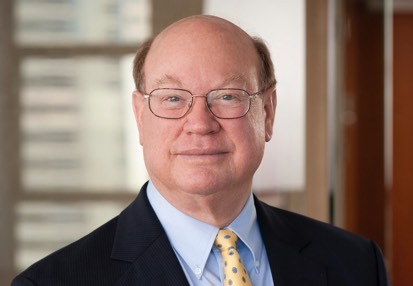 Greg serves as a Trustee of the VMI Foundation, a Director of VMI Investment Holdings, LLC and is a past President of M&A International, Inc. Originally from Virginia, as evident by his accent, Greg resides in Manhattan and enjoys the great variety of people and activities unique to NYC, as well as its ease of access to the world. Non-business hours are devoted mainly to helping young people achieve their educational goals with a smattering of hunting, dog training, skiing and traveling mixed in.